Friedrich W. Rainer (28 July 1903 – 19 July 1947) was an Austrian Nazi politician, Gauleiter as well as a state governor of Salzburg and Carinthia. He is the only Austrian governor who has ever held the same office in two separate states. Rainer was a native of Sankt Veit an der Glan in Carinthia, the son of a German nationalist vocational teacher at a municipal Bürgerschule (secondary school). His father Norbert was a member of the German Democratic Party (Deutsche Demokratische Partei/DDP), and later the Greater German People's Party (Großdeutsche Volkspartei/GDVP). He attended the Realgymnasium in Klagenfurt and, having obtained his Matura degree, studied law at the University of Graz while he earned his living by working in a local banking institution or in general labour. After successfully completing his law examination, Rainer began working in a notary's office and completed his doctorate in 1926. From 1931 he worked as a notary public in Klagenfurt. He married Ada Pflüger on 21 May 1932. The couple had three daughters (born 2 December 1933, 9 May 1939 and 20 August 1942) and two sons (born 29 January 1935 and 31 January 1937). Since Rainer was a student in high-school, he engaged as a member of right-wing organizations in Sankt Veit and also participated in the armed Austro-Slovene conflict in Carinthia. Prior to his graduation from law school in Graz, he joined the Austrian SA in 1923 and joined a Burschenschaft student fraternity. In October 1930, Rainer joined the Nazi Party establishing the local branch in Sankt Veit. A close friend of Odilo Globocnik, he joined the Austrian SS at the end of 1933. In the same year he took up a post at the office of Nazi Gauleiter Hubert Klausner in Klagenfurt. As the Nazi Party had been banned by the Austrian government under Chancellor Engelbert Dollfuss in 1933, Rainer was in August 1935 sentenced to one year in police custody, presumably for high treason. He was released early for good behaviour the following March, nevertheless like Klausner and his deputy Globocnik he had to step down from his administrative role in the party, transferring sole leadership to the rival Austrian Nazi leader Josef Leopold. As Leopold soon fell out of favour with Adolf Hitler, Friedrich was in May 1936 again assigned to the Nazi Party's provincial body in Carinthia. In the course of the Austrian Anschluss to Nazi Germany on 13 March 1938, Rainer was recruited to serve as the organizational staff leader in the office of Josef Bürckel, the Reichskommissar responsible for the annexation of the Austrian lands. On 22 May 1938, Rainer was personally appointed by Hitler to oversee the Nazi Party in the Reichsgau of Salzburg. Upon the 1938 elections, he also was appointed member of the Reichstag legislature in Berlin. Rainer remained in his Gauleiter role at Salzburg, until 18 November 1941, when he was succeeded by Gustav Adolf Scheel. When World War II broke out, Rainer was appointed as Reich Defence Commissar of the military district XVIII. On 15 March 1940, he was additionally appointed as the Reichsstatthalter (Reich Governor) of Salzburg. On 18 November 1941, Rainer was appointed as the Party's Gauleiter of Carinthia, while simultaneously functioning in the role of a governor, thereby also ruling over the adjacent occupied Yugoslavian territories in Upper Carniola. On 11 December 1942, Rainer was made Reich Defence Commissar of Carinthia, much like his role in Salzburg. 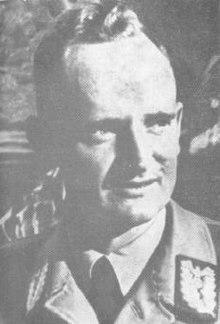 After Italy abandoned its German ally on 8 September 1943, Rainer took over the Operational Zone of the Adriatic Littoral as High Commissioner in the rank of a SS–Obergruppenführer. This act established him as the chief of the civil administration in the Italian region of Friuli, as well as in Yugoslavian Istria and Inner Carniola. On 7 May 1945, eight days after Hitler's suicide, Rainer transferred his official functions to an executive board and fled to the mountainous area around the Weißensee lake in Carinthia. After being given leads by the local population, British occupation troops arrested Rainer and transferred him to Nuremberg Prison in October 1945. On 12/13 June 1946 he appeared at the Nuremberg Trials as a defence witness for the former Austrian chancellor Dr Arthur Seyss-Inquart. On 13 March 1947, Rainer was extradited to Yugoslavia. Here he wrote an 80 page work on the Nürnberg Trials for Yugoslav authorities. On 10 July 1947, he was brought before a military court of the Yugoslav 4th Army at Ljubljana. He was found guilty of crimes against the people and sentenced to death by hanging on 19 July 1947. His widow received a death certificate from Yugoslavia after the war, which showed that same date. For decades afterward, the date of his execution was unknown and could only be speculated. In 2010, documentation came to light in the Slovenian National Archives in Ljubljana which may well have answered the question. An entry in the diary of Boris Krejger, former Interior Minister in Slovenia, indicates that Dr Rainer was executed with a number of other prisoners in late November 1950. The long delay in Rainer's execution is explained by the fact that Tito's secret police utilized him as an informant. Upwards of 3,000 pages of his words, written from the Summer of 1947 through late 1949, and probably into 1950, have been deposited in Slovenian National Archives. Rainer, Friedrich. On Brecht and Eisenstein, New York: Telos Press, issue 31, 1977. René Moehrle, Judenverfolgung in Triest während Faschismus und Nationalsozialismus 1922-1945, Berlin 2014 (ISBN 978-3-86331-195-7), S. 305–460. ^ a b Miller 2017, p. 384. ^ Miller 2017, p. 367. ^ a b c Miller 2017, p. 382. ^ a b c d e f g h i j k l m Miller 2017, p. 383. Wikimedia Commons has media related to Friedrich Rainer.